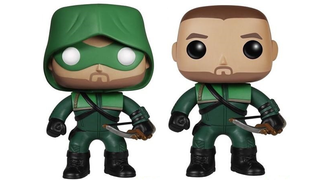 The Arrow we see on television is essentially Batman with a Bow, and we love him for it - but Oliver Queen's stern nature as the archer of undetermined viridian hue is exactly well reflected in this new Funko Pop toy. In fact, he looks pretty damn adorable for a vigilante who goes about sticking arrows in people. The first wave of Pop! Vinyls based on both Arrow and The Flash were unveiled at Funko's New York Toy Fair Booth this past weekend, but the company have now put out promo shots for the first four in the Arrow wave: Two flavours of Oliver Queen (masked and unmasked) seen above, a Black Canary labelled neither as Laurel or Sara - presumably to sidestep more Laurel-angst from fans - and Deathstroke. There's no release date for them just yet, but I'd expect them in the next couple of months, as Funko tend to bring their stuff out quite shortly after an official reveal. These are nice and all, but that said, it's kind of sad that the first bunch has two Ollies in instead of say, a Felicity or Diggle. If it's going to be an Ollie-Arrow distinction, why not just put the Ollie on a suited/casual clothed body? Basically, give me all the figure-y Felicity Smoaks that you can, dammit!